This chapter was partially done by Dk988, and the rest was done by me. Enjoy. You know, I expected you guys to at least react a little bit when you heard the name Zhuge Liang… do you really not know the man? I am disappointed. When Cho Ryu Hyang had woken up, 10 days had gone by. When he first opened his eyes the first thing that entered his vision was an old, wrinkly man servant’s face. Cho Ryu Hyang looked around absent-mindedly. He was very confused. His head was filled with knowledge everywhere, which was stuck in countless places in his mind. There was knowledge in his head he didn’t have before. As he was organizing the knowledge in his mind, something happened. The old manservant ran outside all of the sudden. There were series of loud sounds outside, and a huge fellow ran into the room. It was Peng Ga Ho. As soon as he came in, he grabbed a seat, and sat down. He took a look at Cho Ryu Hyang, and opened his mouth. Peng Ga Ho didn’t know this, but Cho Ryu Hyang right now was extremely healthy. No, his body was actually suppressing an unknown power inside from bursting forth. Cho Ryu Hyang’s face was full of shame. Grandpa Jang was someone who followed him all the way from the main house to serve him. Cho Ryu Hyang was extremely grateful towards grandpa Jang because of that. Even though they had a master-servant relationship, Cho Ryu Hyang held special feelings for grandpa. Thinking that the person was going to reprimanded by his parents because of him, he felt sorry for grandpa. Thinking about it, there was a need to know a bit more about what happened to his body . But it really was quite strange. He felt like he just lied down for a little bit, but ten days had already gone by? Cho Ryu Hyang made a bitter smile. Cho Ryu Hyang didn’t faint because of overwork, but he didn’t feel like explaining. It was because Cho Ryu Hyang himself was still confused if the event that took place in the library was real or not. Peng Ga Ho was about to leave when he stopped by the door. He hesitated a bit, and then he opened his mouth. Cho Ryu Hyang couldn’t find an appropriate response. The reason was because Peng Ga Ho came at him at both warmly, and yet struck him heavily. Only after the doctor came in to check up on him, and prescribed him a few medicines, was he able to be truly alone. There were immense changes going on in his body. Could Cho Ryu Hyang truly use the mystical powers and perform miracles, just like what the book said? When he thought about that, Cho Ryu Hyang’s head got jumbled up a bit. 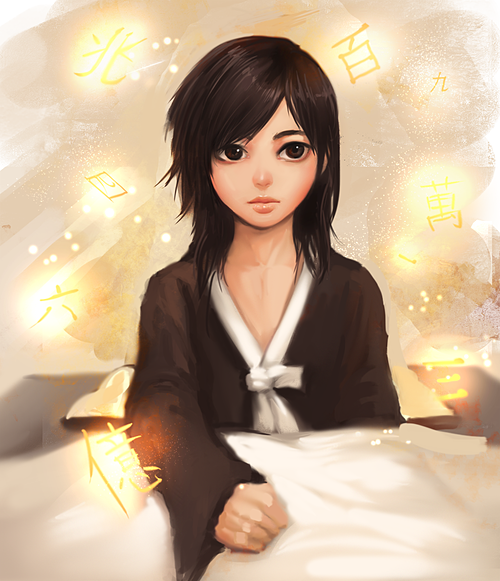 Cho Ryu Hyang always thought that his rationality and logicalness was his strongest points. After attaining a power that he himself couldn’t explain with words, however, his mind became chaotic. But what weighed on his mind the most currently was not this. Since awhile ago, something, or someone, in his head was unraveling the knowledge packed inside his brain in a way that Cho Ryu Hyang could understand scarily fast. It felt like some kind of an entity was teaching him about these newfound knowledge, step by step. It was a interesting experience. As soon as questions popped up in his mind, it was answered almost at the same time. It was definitely weird. Cho Ryu Hyang closed his eyes. The moment he did so, a figure popped out in his mind. The old man looked at Cho Ryu Hyang in an arrogant way. It seemed that this old man was the one that was explaining everything to him. It was a type of communication where words were transferred directly into his brain, instead of being transferred by sound. Cho Ryu Hyang hesitated a little, then opened his mouth and replied. The old man smirked at him. Cho Ryu Hyang’s face went red with the old man’s words. It seemed like the old man could read Cho Ryu Hyang’s mind because he was in his mind. If it’s like this, Cho Ryu Hyang was unable to lie to him. Cho Ryu Hyang quickly stopped himself from shouting ‘Don’t lie!’ in his mind. Unexpectedly, the old man’s face implied that he didn’t really care about Cho Ryu Hyang’s attitude. For now? Does that mean they would be able to talk in great lengths in the future? When that question floated into Cho Ryu Hyang’s mind, the old man immediately answered him. Even though he didn’t really ask the old man the question, the old man answered immediately. This was actually quite convenient. When Cho Ryu Hyang wondered this, the old man replied. If what the book said was true, then he would be able to walk great distances, and fly, even. These powers would indeed help him out a lot in life. Did the old man read his thoughts? The old man’s face grew stern. Then was there no ability at all? Cho Ryu Hyang became a little disappointed. The old man then smiled in a mysterious way, and said this. Cho Ryu Hyang felt sleepy all of the sudden, and started falling asleep then. Watching this, the old man complained a little. The old man wasn’t really satisfied with it, but he couldn’t do anything about it. After all, it was a blessing to even acquire a child like this. The old man resolved himself by telling himself that the boy would be quite all right once he trained him. He had high expectations for this child. In the middle of this hall, there was a finely dressed official, and a lean middle-aged man. The middle aged man had a playful, harmless look on his face. If a person actually knew who this man was, no one would actually dare to look down on him. This man was the pope of the current Heavenly Demon God’s Church, and a member of the 15 guests of the land (三皇五帝七君). He was one of the 3 sovereigns, even. And this man was the Dark Emperor, Gongson Chun Gi (公孫天器) . Gongson Chun Gi licked his lips, as if he felt inconvenienced by this whole affair. Looking at that, the man dressed in red carefully said this. When the man said this with absolute loyalty in his voice, Gongson Chun Gi shook his head after contemplating on the man’s statement a little. It was regrettable, but Gongson Chun Gi decided to not go for it. It wasn’t as if there weren’t any other ways to do this, anyways. The red man replied immediately. Gongson Chun Gi had a satisfied expression on his face. The red man had a sorry look on his face when Gongson Chun Gi complained. When the man in red set out, Gongson Chun Gi sighed once, and spoke. –Isn’t it something that’s worth that much? The man in the darkness. The bishop Lim Hak Gyum, who was the leader of the the pope’s personal guards, Mara’s Heavenly Wind Division, made a bitter smile. This was a man who could be said to have the world’s strongest martial art. That’s why he was unable to say anything when the pope said he didn’t care about the martial art’s value. –Why not pass on the task to the elders and return the the private chamber to take a rest? Lim Hak Gyum laughed silently in his mind. The pope did all he could for the church, even when he was complaining about this and that. Even though he possessed a strength greater than anyone else, he never showed off, and instead lowered himself to other’s levels and talked to them with care. He was truly the role model for a pope. –A dangerous thing such as that, if it goes in the hands of anyone else, I’m afraid they’ll simply use it to bully others. It is better if we kept it in our hands. Gongson Chun Gi sighed. It wasn’t one of those playful sighs he threw around everywhere. It was a serious one. The pope spoke while massaging his own shoulder. –Yes, your holiness, please speak. Gongson Chun Gi laughed as he said that. He was annoying, bothersome, and he really hated things that required a lot of things to be done. In fact, he avoided it like a plague. He even shortened techniques in the“Shura Sector” (修羅幻經), which had several hundreds of techniques, to ten techniques, just because it was too bothersome to learn all of them. Thanks to that, the already powerful Shura Sector had its power multiplied by 4 times. Lim Hak Gyum believed that if Gongson Chun Gi actually sought to be the strongest, and actually tried to do it, he would’ve been able to conquer all under the heavens. This man had that much talent. –……Your follower is too dull-witted to be able to be of any help. I apologize. Gongson Chun Gi stretched his neck a bit, thought a bit while doing so, then spoke. –It shall be as you say. At the meeting room of the school, multitudes of scholars were debating about something. An elder with an air of dignity about him. He was Eu Hyun Guk (遊絃局), the teacher of ancient Chinese literature. He looked Jo Gi Chun, and spoke up. But Jo Gi Chun simply responded with a quizzical face. He was a man who wouldn’t even twitch if a lighting struck a boulder right next to him. His face contorted in disgust when he heard that. It was true that Cho Ryu Hyang taking first place took Jo Gi Chun by surprise. But there was no cheating involved in any of it. Jo Gi Chun knew this better than anyone else, so he was confused about why this matter had to come up, now of all times. Jo Gi Chun was able to figure out why this scholar was acting this way. He understood why the man did it, too. For people who didn’t know mathematics as well as he, Cho Ryu Hyang’s feat might indeed seem like an impossible task. Discussing all this in public, it seemed the old scholar came with great resolve. Many of the students became very sensitive to cheating recently. When talking about such things, one must refrain from talking about it in public. When he was about to speak, the calligraphy teacher, Jo Yu Chun (調柳川), wormed his way into the conversation. Eu Hyun Guk agreed with him wholeheartedly. The problem they were discussing at the present had to do with Cho Ryu Hyang’s answer sheet. No, it wasn’t the perfect score the boy got that was the problem. It was the time that was the real problem. Everyone was given two hours time to work on the test. Most people weren’t even able to solve all the problem within this time frame, but Cho Ryu Hyang was different. He solved over a hundred problems in less than an hour’s time. This was only possible if someone actually went and memorized the answer sheet, at least in normal people’s eyes. At first, when the test overseers saw Cho Ryu Hyang turning in the paper first, they thought the boy gave up. Jo Gi Chun’s face turned normal again after drinking a cup of tea. All the other scholars nodded there head in agreements, except for Jo Gi Chun. Since everyone else was thinking like this, the man wasn’t even mad. These men did not know. These men did not know how deep the subject of mathematics was. The people here only got along with Jo Gi Chun because they had to work together, but in reality, they looked down on the subject of mathematics. Jo Gi Chun already knew about this. The art that only lowly merchants learned. They believed mathematics to just be a play with numbers. This was how the rest of the world viewed math. That’s why Jo Gi Chun believed that these scholars had such a reaction. Jo Gi Chun’s was being very assertive about it. In fact, he, too, could accomplish this feat by himself. He didn’t know about anyone else, but even now, when he retired from his job, he was able to solve problems of this caliber in an instant. Of course, this was only a result of countless days of hard work. The fact that Cho Ryu Hyang was able to do this surprised Jo Gi Chun, too. But he did believe that the boy achieved this with his own skills. If the boy did work as hard as he, would there not be results to show for it? But no one in the room seemed to think that way. They only thought that they were right, and no one listened to Jo Gi Chun’s own opinion. Jo Gi Chun couldn’t figure out why they had to go to such lengths for just this. But he decided to think about it calmly, for now. Even if they held another test, the result was going to be the same. There really was no need to take a retest then, was there? Jo Gi Chun really didn’t like to waste his time. Jo Gi Chun finally understood why there was so much pressure from the teachers. If even the scholars deemed this feat impossible, wouldn’t students think that way as well? The boy who seemed to have given up on the test got first place. And he was the youngest child in the whole school, to boot! It was a useless sense of inferiority. Jo Gi Chun wasn’t the type of person to expend his energy to get emotional. It just wasn’t in his nature. Getting first place in the school in a certain subject brought many benefits. One could get a scholarship, and a private room for studying. Was it because of that? Many of the students that first came here studied as if their life depended on it. They fought each other for the top spot, which had an immense effect on the school. But after the appearance of Nangong Yubin, it all changed. Since the boy took first place in every single subject in the school, other students started to feel inferior compared to him. The scholars in charge of their own subjects became very worried. How could they escape from this predicament? They tried to mentor various students at first. It was to get someone else to take first place, instead of Nangong Yubin. But it all failed. Nangong Yubin was a genius of all geniuses. When the scholars were just about to give up, Cho Ryu Hyang just rolled in and took first place in math. It was a strange thing. They thought Jo Gi Chun did something behind their backs. As the man liked to stay alone, the scholars misunderstood the man’s personality. Jo Gi Chun too realized how the scholars were looking at it. They weren’t doubting Cho Ryu Hyang, the student. No, they were doubting the teacher, Jo Gi Chun. He saw people like this in the imperial court, too. Was it like this wherever people lived? The scholars were using a fairly simple strategy on him, but he just went with it. As long as he could study math, he was willing to let some things pass. This was one of those moments. Eu Hyun Guk, the man who addressed this problem. Jo Gi Chun was very well aware that this man did not like him. Because Jo Gi Chun was a person who was hard to get along with, and was antisocial in general, he sometimes treated others coldly. He didn’t realize it would all come back to him in a way like this, but what’s done is done. And that’s how Cho Ryu Hyang’s retest was set. Of course i Know him. Anybody that plays Dynasty Warriors or saw anything related to romance of the three kingdoms knows how smart he is. He just served a foolish lord. Historically, Zhuge Liang was much less impressive than what’s shown in most games, movies and the novel. His main strength was in administration rather than battle though he did well(but not great) in his campaigns after Liu Bei’s death. Liu Bei himself was hardly foolish. Prior to his death, he accomplished much of what games,etc attribute to Zhuge Liang. Even Chi Bi was essentially purely accomplished by Wu with Shu’s contribution being merely additional manpower. Zhuge Liang… as someone who’s just barely heard of the Romance of the Three Kingdoms, I only know that those people are amazing, but not the particulars. I apologize for my ignorance. Thanks so much for translating this!!! I know of Zhuge Liang, not much. He’s mostly inserted,referred or mention in most novel specially historically based. But i dont think i or others have to speak of it if they ever read it in one novel everytime?